NCAGC stands for the National Capitol Area Garden Clubs. A Federated Garden Club with some of the most interesting people I have met. As a member of the Capitol Hill Garden Club – District I, the opportunities are exceptionally exciting. Under the Leadership of President Edwin Peterman, Capitol Hill Garden Club continues to be a welcoming and growing Garden Club. I am proud to be a member and glad to represent CHGC on this journey. The President of NCAGC is Robin Hammer and I can’t tell you how enthusiastic she is about NCAGC. Starting today, we are embarking on a 4 day trip to the Newport Rhode Island Flower Show. Four days with like minded NCAGC members and guests, interested in exploring Newport Mansions and Flowers, of course. 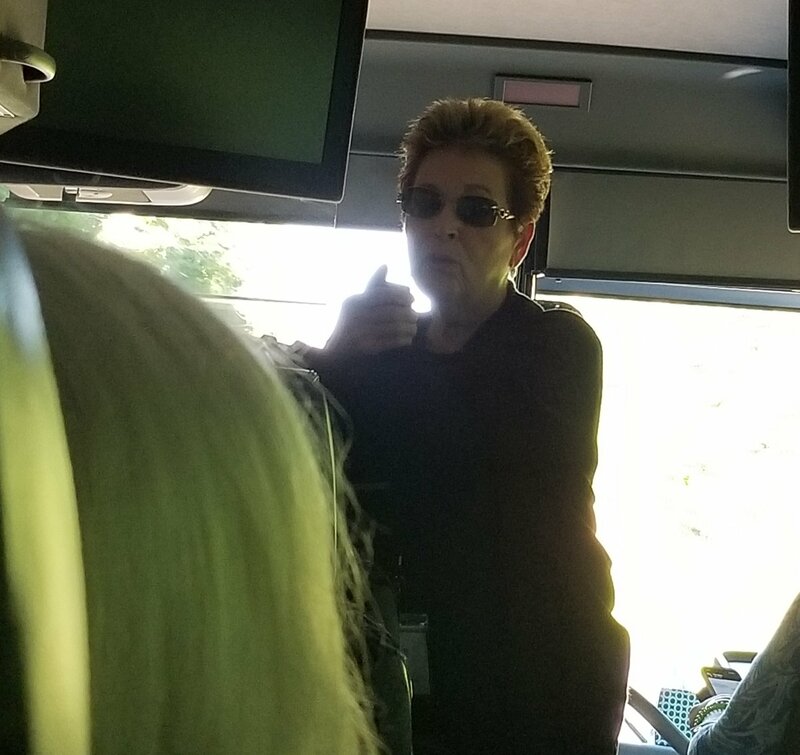 Our Presidents Trip Tour Directress is Ronnie Levay. Ronnie chose Haymarket Bus Lines to get us to Newport safely in cool and comfortable conditions. Clinton, our driver, checked his GPS to make certain we are on the best possible route. Senior travel definitely has a more relaxing feel. Everyone is simply kicking back and enjoying the ride. We are talking to each other and few are performing the “cellphone prayer” position. Hearing words has never been so good! We are engaging with each other or reading real books. One NCAGC member even brought along assorted magazines to share. Thinking and sharing as a collective group is wonderful! One of the NCAGC members even took over the microphone to inform and assist everyone on how to connect to the Haymarket bus WIFI. Anyone having difficulty, she happily walked down the aisle to assist. Did I mention our group consists of Senior men and women? The camaraderie demonstrated within this group is amazing. From sharing stretching techniques at rest stops, crying at the movie “Parental Guidance” to simply starting good conversation – NCAGC continues to be the perfect bloom in my life garden. Why even old friends have come along for 4 days of exploring Newport Mansions with the NCAGC. I had to dig up my travel buddy,Mary Alice O’Halloran to enjoy this excursion, perhaps to meet other Seniors or just to enjoy the experience. Why take a bustrip? The opportunity to meet other people who are interested in flowers and gardening for the pleasure of it. There is time to chit chat, share garden stories, time to take naps. and no baggage check. In a less than perfect world, the pleasure of escaping into floral bliss with the NCAGC is certainly the break I needed. As Blaise Pascal once said “In difficult times, one should always carry something beautiful in your mind”. This bus, filled with Senior and a few Potential Senior NCAGC members and guests are in the mood to embrace the beauty that will surround us. Follow our journey over the next few days as we enjoy our Presidents Trip to the Newport Rhode Island Flower Show. Stay tuned for small group Garden Experiences curated by Cottage In The Court. If you desire a “garden experience” instead of a garden trip, wait til you see what surprises are in store. A Girlfriend’s Day Out, Horticultural Bridal Showers, Small Group Garden Chats, a simple Garden Club Travel Guide to discovering all things beautiful, there is something about the garden for everyone. Stay tuned and consider a Garden Experience with Cottage In The Court. Dear Teri, This is wonderful! I felt like I was on the trip! Thanks so much for always sharing such terrific gardening news!